I sell one of my Russian shotguns Baikal MP-153 12ga barrel 28" chamber 3.5" black synthetic. 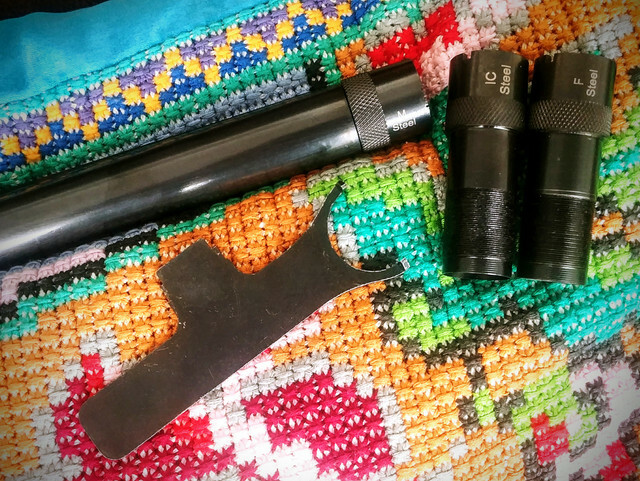 It includes three extended chokes IC, M, F - all of them are steel shot rated, plus a wrench tool to let you adjust the gas valve whenever you decide to shoot light load shots. The gun condition is like new. It has seen only under 200 shots so it is not even completely broken in. Yet I was goose shooting and it never fails to cycle even if I mix 3" and 3.5" shells of different brand - see the picture below. I took the limit of those 5 geese last October. 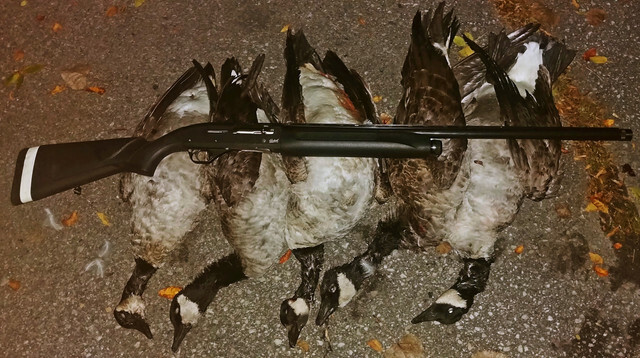 No guides, no decoys - just pass shooting alone from midday till evening. It is 18.4mm 12ga bore like German and Italian gun makers do - because this makes good seal between wad and the bore walls which makes the gun very hard hitting. And it is reliable like a Russian tank. The white band on the stock is the custom made spacer (I cast and fit it myself using liquid plastic), I have not had time to paint black that spacer. Added it because I'm 185cm tall, long neck and arms and I know something about the gun fit. 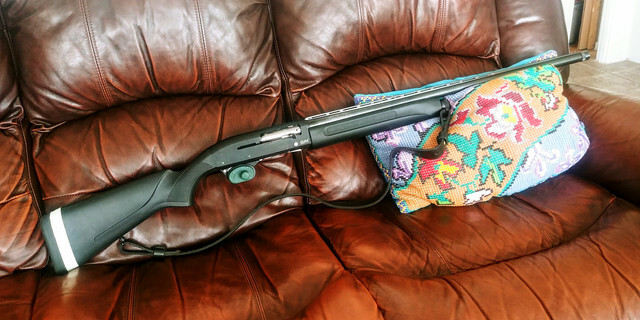 You not gonna find a spacer for mp-153 on the Internet, so this is your chance to have an excellent shotgun at a budget price with possibility to fit it like more $$$$ expensive brands do. If you're under 180cm tall - the spacer can be removed. I can do it for you right on the spot. The only reason I sell it, because I already have too many guns. My girl turning 12 this spring, she gonna learn shooting and hunting with me. So I need money to fund buying a lightweight 20ga for her. My wife strictly resists getting one more gun - this is the reason I need to sell one before buying another one. This is your chance to get a tested, reliable, hard hitting and straight shooting Russian semi-auto which is a lot of gun for its price and will last you a lifetime. the shoulder sling , three chokes and tool are included. If you're located too far from Pierrefonds (H8Y) I can accept EMT and ship it to you anywhere by Canada Post + please add $50 for shipping and be ready to email a photocopy of your PAL card. Or bring cash if you come in person.